I hope you had a fabulous weekend. Mine was pretty quiet but was able to do some crafting. Today I am sharing an image called "Gentleman Hippo" and I just fell in love with him. I guess it's because I love hippo's and he's just perfect to me. The Artist is Sandra Caldwell and I just adore her images. 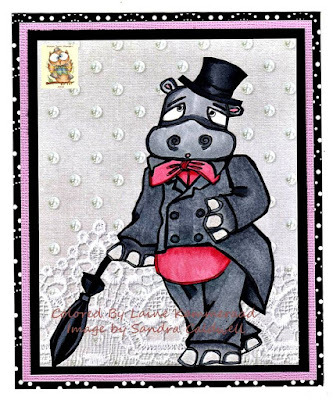 I colored him with Copics and decided to make his Tuxedo gray with a splash of pink. I choose a cardstock with the light gray background but with a look of texture and hopefully elegance. He was definitely fun to color and I hope he makes you smile. This is the link to Sandra's Facebook group if you would like to join us. Thanks so much for stopping by - I really appreciate it. I will be back with lots more goodies to share this week and I hope you will come back. So Debonair! I really like your color matches.